The pressure is officially on in Philadelphia as superstar quarterback Michael Vick and company will start the NFL regular season on the road and under the microscope as everyone wants to know just how good this “super team” really is. With all the Pro Bowl additions and the one of the most talented young teams in the league, the Philadelphia Eagles will have a lot of pressure on them to be successful right out of the gate. Fortunately, Week 1 could be a good test for Michael Vick and the boys as they will travel to Missouri to take on the up-and-coming St. Louis Rams. 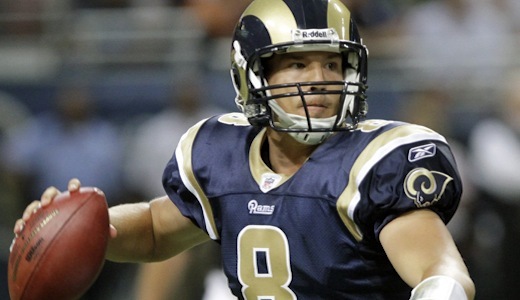 Last season the St. Louis Rams showed some signs of life as their gamble to take quarterback Sam Bradford with the number one overall pick in the 2010 NFL draft paid off as the former Heisman trophy winner turned out to be much better than anticipated in his rookie season under center in St. Louis. The rookie quarterback wasn’t able to turn the team around in terms of making the playoffs or even finishing the season with a winning record, but he did come just one game shy of winning the NFC West and making a run in the postseason. This year no one should be surprised that Sam Bradford can play the position as a starter in the NFL and actually make the St. Louis Rams into a force to be reckoned with in the NFC Conference, but he still doesn’t have the kind of receiving corps he needs to make this offense intimidating. The Philadelphia Eagles will almost certainly look to put a lot of pressure on Sam Bradford under center, but they will also have to be concerned with one of the best running backs in the league coming out of the backfield in three-time Pro Bowler Steven Jackson. If the Philadelphia Eagles can contend Sam Bradford and Steven Jackson on Sunday, the St. Louis Rams won’t stand much chance of making this a competitive football game. With the upgrades on defense in Nnamdi Asomugha and Dominique Rodgers-Cromartie, Sam Bradford might have a tough time passing the football all night long and as a result might have to hand the ball off. The St. Louis Rams will be a good football team this season that could possibly challenge the San Francisco 49ers, Seattle Seahawks and the Arizona Cardinals for the NFC West division title, but they will almost certainly be on the losing side of this matchup as the Philadelphia Eagles will be just too much for them to handle. As of right now, the Philadelphia Eagles are favored to win this Week 1 showdown with a -5 point spread. This spread is a pretty favorable as I could see the Eagles blowing out the Rams and covering this spread by a mile! Take the Eagles at -5.